An RMO can be repicked using hand picks after auto-picking. To do this, you can adjust the right handle of the dashed line in the Gather View. The following section describes instructions to re-pick using a 3D horizon as the seed. Open the Gather View which shows the RMO auto-picks. At the dashed line, drag the right handle to change the curve of the parabola. If you modify the curve, the handle will change from a hollow square to a filled square. Click Clear All Hand-Picks in the Picking section in the Details Panel of the Imaging tab to reset the handle. At Re-pick, click Current gather to extend the 3D horizon into the offset dimension for the currently selected gather only, Visible gathers for all the visible gathers (if you are displaying multiple gathers), or Entire horizon to pick RMO along the entire horizon based on the hand-pick. 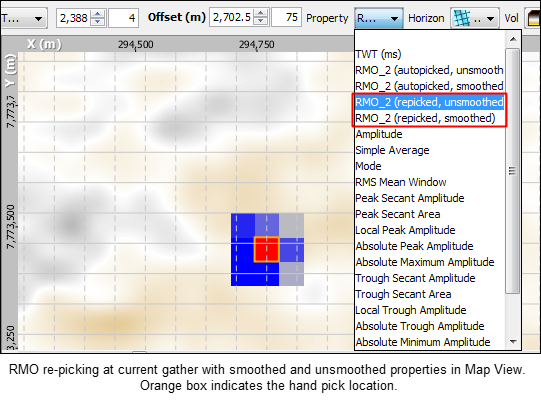 Once you have re-picked based on the hand-pick, notice that in the Map View, the horizon properties for "repicked, unsmoothed" and "repicked, smoothed" (if smoothing is applied) will be available.